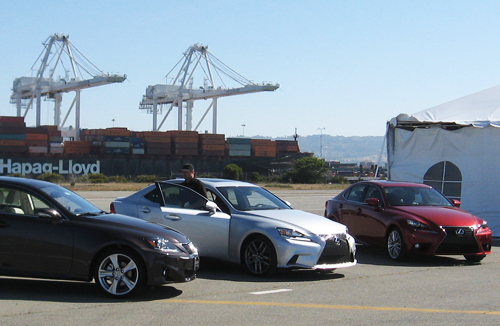 This week, Lexus invited select members of the media to discover, learn about and drive the new and highly improved 2014 Lexus IS during events staged in San Francisco at the decommissioned Alameda Naval Station. “The all-new Lexus IS is the culmination of an unprecedented refresh of the entire Lexus line,” stated Brian Smith, Vice President of Lexus Marketing, during the introductory presentation. Lexus sold 240,000 vehicles last year and with the refreshed line-up expects US sales to exceed a quarter-million units during 2013. Smith also announced the hiring of 2,400 Technical Specialists, deployed at dealerships across the country to aid customers with the growing array of telematic and infotainment features of the Lexus Enform and Insider systems, among other features. One such specialist in New York had a customer who was having trouble pairing her phone. When she came into the dealer, the technician was also unable to sync up the phone and began to suspect the problem was in the phone itself. The customer agreed to leave the phone overnight so he could work on the problem. That evening the technician took the cell phone back to the retailer to have it checked and sure enough there was a problem with the Bluetooth. A working phone was substituted with personal data transferred. Then next morning the woman was amazed at the ease of pairing the phone. That’s the reason Lexus has added this salaried, non-commissioned position – to provide a level of service meeting the technical challenges of the modern automobile. Smith mentioned a Lexus partnership with the Weinstein Company, hiring a number of fresh young directors to produce film shorts related to the brand and its cars. Two of those short films will appear at the upcoming Cannes Film Festival. He also referred to the company’s two-page Sports Illustrated ad that allowed users to reveal swimsuit models in the image using an app for smartphones as examples of how the brand is broadening their marketing approach in recognition of today’s increasingly interactive and social media driven world. The IS attracts the youngest range of buyers in the premium sports sedan segment, outperforming both BMW and Mercedes-Benz in those terms. Bill Camp of the Lexus College took the mike to highlight the million miles of over the road research and development that went into the third-generation 2014 Lexus IS. An impressive list of production enhancements began with the reinforced and much more rigid body – efforts that proved to greatly enhance both handling and noise levels in driving trials held later. Metal adhesive bonding and additional laser screw and spot welding serves to engender much greater rigidity in the frame, working in collusion with retuned springs and shocks to significantly improve cornering. Even the sway bars have been made stiffer to enhance directional acumen and diminish body roll. Additional bracing adds to the overall rigidity of the 2014 Lexus IS. In the IS 350 RWD model, the sedan shares the 8-speed transmission of the IS-F.
All models now have Variable Gear Ratio Steering, which marries steering response to vehicular speed – so the level of control on the street at normal commuting speeds turns into the authority you want should you take the IS to the track. On the F-Sport model, G-Force Artificial Intelligence will anticipate needed power in S-curves, holding the gear position as you swerve to smoothly deliver the same level of torque when you emerge into a straightaway. Working in concert with these enhancements, aerodynamics have been tweaked to improve downforce and control the boundary air layer surrounding the vehicle in motion, resulting in a coefficient of drag between 0.28 and 0.29. Aero-stabilizing fins have been added to the A-pillar and rear lamp clusters to facilitate airflow beside the car, pulling it closer to enhance vehicle stability at speeds over 25 mph. Vortex-generating fins beneath the car increase downforce and thus aid the IS to more firmly grasp the road. Even the platform has been updated to comprise less weight from fewer parts, while still adding to the overall rigidity of the vehicle, despite the addition of a new subframe. The svelte IS body has dropped a full 22 lbs. of weight, despite the slightly longer bumper-to-bumper length and stretched wheelbase. With all the other changes, the brakes now need to keep up, so the caliper pads feature a new high friction surface, providing even quicker stopping. That’s what we concluded when the drove the various models with competing models from other luxury brands the next day, but that’s another story. Incidentally, the naval cranes in the background of the 2014 Lexus models pictured above were the inspiration for the Imperial Walkers in the George Lucas Star Wars series.